American billionaire Warren Buffett is completing his takeover of the Iscar company from the Wertheimer family : The chairman and CEO of Berkshire Hathaway Inc. is buying a 20% stake in the Israeli tool maker for $2.05 billion, gaining full control of the company. In 2006, Berkshire bought an 80% stake in Iscar, a maker of metal cutting tools whose formal name is IMC International Metalworking Cos, for $4 billion. 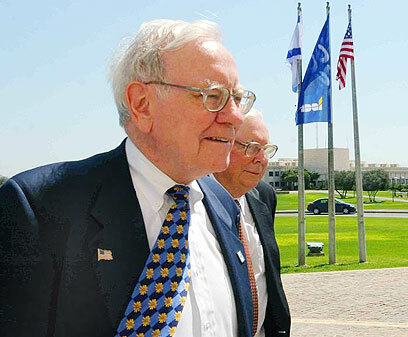 At the time, that purchase was one of the largest acquisitions involving an Israeli company, and Buffett's biggest bet outside the United States. Wednesday's purchase suggests that Iscar's value has since more than doubled. Talking to Calcalist, Iscar Chairman Eitan Wertheimer said: "It was important for us to sell the business before family problems began. We see what is happening in other family businesses, and we shouldn't wait for problems. "As far as we're concerned, the sale process began as early as seven years ago in the first deal for the sale of 80% of the shares. Both parties had options to complete the deal." "This is the right move for the employees, for our family and for the company, which is had many good years ahead," added Wertheimer, whose father Stef founded the company in 1952. "Buffett will infuse another $2 billion for investment in Israel, and as far as he is concerned it means a huge commitment to Israel as well. "It was Stef's dream to leave the company in Israel. Stef had been engaging in philanthropy for the past 40 years, and I am engaging in philanthropy and other things for 20 to 30 years." Buffett said in a statement, "Since the time IMC entered our lives, my partner, Charlie Munger, and I have enjoyed Berkshire’s association with the company, the Wertheimer family, and the company’s management team. As you can surmise from the price we’re paying for the remaining interest, IMC has enjoyed very significant growth over the last seven years, and we are delighted to acquire the portion of the company that was retained by the Wertheimer family when IMC first became a member of the Berkshire group of companies. Eitan Wertheimer said in a statement, “We are very pleased that IMC has found a permanent home in Berkshire Hathaway, which fully appreciates the unique nature of the global Israeli enterprise that we have created, and that is committed to remaining true to that heritage in every way, building on and continuing our historic success and special culture. "The growth experienced by IMC since the 2006 Berkshire transaction validates the faith that Warren and Charlie showed in our business and the special people in Tefen, Israel and around the world who have made our success possible. We are confident that the vision begun by Miriam and Stef Wertheimer, and carried forward by the family’s second generation, in partnership with IMC’s supremely talented and dedicated executive team, will continue to drive the group forward as a part of the Berkshire family, under the leadership of President and CEO Jacob Harpaz." IMC makes tools at facilities in the US, South Korea, Brazil, China, Germany, India, Italy and Japan. The acquisition was announced three days before Buffett will welcome more than 35,000 people to Berkshire's annual meeting in its hometown of Omaha, Nebraska. In his annual letter to shareholders on March 1, Buffett described Iscar as one of Berkshire's five most profitable companies outside its insurance businesses. While Berkshire does not break out Iscar results separately, it said the Tefen, Israel-based unit's profit fell in 2012 because of slowing economic conditions in some non-US markets. A year ago, Buffett in his shareholder letter described Iscar's management as "brilliant strategists and operators." Iscar ended 2012 with more than 11,900 employees. See all talkbacks "Buffett buys rest of Iscar for $2.05B"